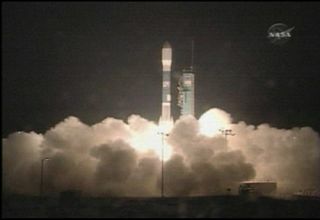 NASA's CloudSat and CALIPSO spacecraft launch spaceward from California's Vandenberg Air Force Base on April 28, 2006 after six days of delays. After aweek of launchscrubs, poorweather and other delays, two NASA satellites successfully reached orbit Fridayto begin their mission to scan the Earth's clouds in three dimensions. NASA's CloudSatand CALIPSO spacecraft successfully launched spaceward atop a Boeing Delta2 rocket at 6:02:16 a.m. EDT (1002 GMT) from Vandenberg Air Force Base in California. The space shot comes after six days of delay caused by glitches, refuelingplane schedules, high winds and poor weather. "When welifted off you could just feel the release," NASA launch director Chuck Dovalesaid after CloudSat's deployment. "Not only in watching the vehicle on the pad,but the release of the folks here in the launch center." The twospacecraft are expected to produce unprecedented views of Earth's clouds andaerosols - fine particles suspended in the atmosphere - that can be used totrack climate change and improve weather forecasts, mission scientists said. CloudSat's $185million mission calls for the probe to peer through Earth's clouds using apowerful radar 1,000 times more sensitive than typical instruments to identify individualparticles of clouds, rain and snow. "Cloudsfundamentally influence the greenhouse [effect] of the climate," said GraemeStephens, CloudSat's principal investigator at Colorado State University in Fort Collins, before today's launch, adding that Earth's water cycle sets thepace for greenhouse gases and global warming. "CloudSat is trying to get ahandle on the key aspects of that water cycle." The $223million CALIPSO - short for or Cloud-Aerosol Lidar and Infrared PathfinderSatellite Observations - carries a laser ranging, or lidar, instrument and twoother tools to identify and characterize aerosol distribution in the Earth'satmosphere. The spacecraft is a cooperative effort with the French Space Agency(CNES). CloudSatand CALIPSO were deployed - CALIPSO first - in a 438-mile (705-kilometer) orbitwhere they are expected to join three other spacecraft already in orbit.Together with NASA's Aquaand Aurasatellites, as well as France's PARASOLspacecraft, CloudSat and CALIPSO will make the "Afternoon Train" (A Train)of Earth-observation, mission managers said. Friday's spaceshot not only marked the beginning of the joint CloudSat and CALIPSO missions,but also the end to almost a week of flight delays for the beleagueredsatellite pair. "It was aquite difficult mission almost from start to finish," Dovale said of thelaunch. "We had quite a few scrubs and in between we days where we calledthings off early." An initialApril 21 launch attempt wasthwarted with just 48 seconds left before liftoff after CALIPSO lostcommunications with its support center in France. Flight controllers quicklyreestablished the communications link, but missed the split-second launch windowthat day. Launchopportunities on Saturday and Sunday were plagued by a different ailment: theunavailability of a refueling plane needed to supply a radar tracking aircraftthat monitored today's liftoff as the Delta 2 rocket carried CloudSat andCALIPSO out of range of flight controllers on the ground. Highwinds cropped up four minutes before a Tuesday launch attempt, scrubbingthe attempt, while a poor weather outcast prevented a Wednesday launchoutright. The finalscrub occurred early Thursday, when a temperature sensor returned errantreadings that prompted engineers to call off the launch and look into thematter. The issue was later resolved and the launch attempt shifted to Friday. "This wastechnically the fourth attempt...a great success," Dovale said.